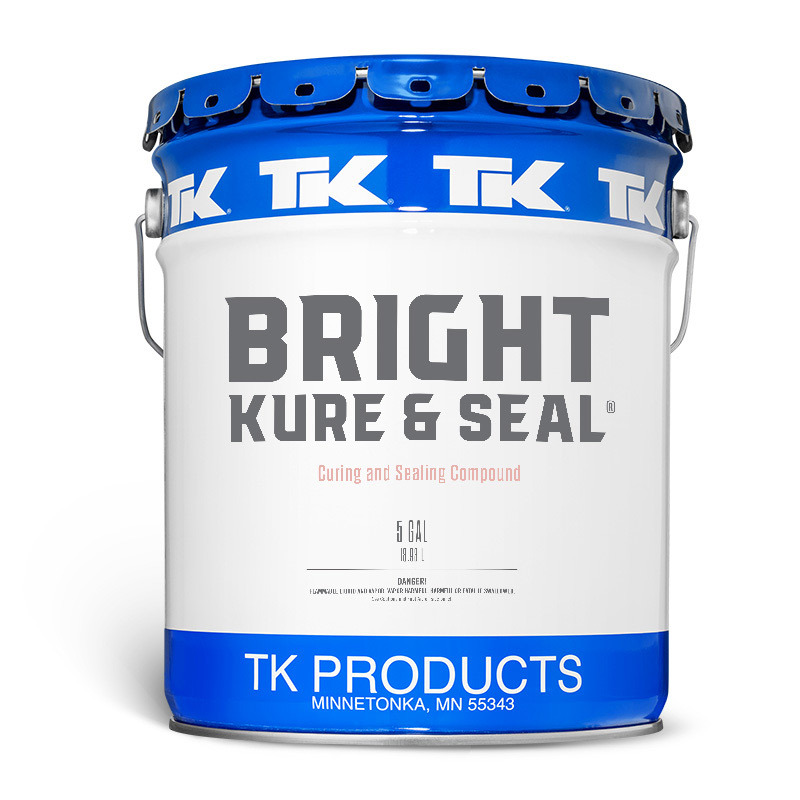 TK Product’s Bright Kure & Seal is a 100% Acrylic concrete cure and seal that is 26% solids. Formulated in a gloss or matte finish, TK’s cure and seal has been approved by the Department of Transportation (DOT) in the use of curing decorative concrete surfaces in some states. Bright Kure & Seal can be used in interior and exterior on both freshly poured concrete as well as existing concrete surfaces for ultimate protection. 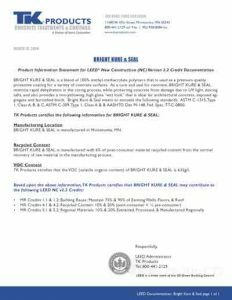 Bright Kure & Seal was formulated to protect architectural concrete such as exposed aggregate, colored, and stamped concrete. A 26% solids, non-yellowing, cure and a seal made from pure 100% acrylic. It has been tested and approved by the Minnesota (DOT) Department of Transportation for the curing of decorative concrete surfaces. Available in a gloss and matte finish. 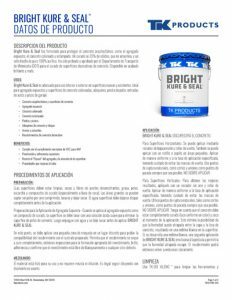 Bright Kure & Seal Application Uses. Surfaces must be clean, dry, and free of form oils, grease, dust, frost, and curing compounds (particularly wax-based). Large areas may be blown dust free by compressed air, washed, and let dry. Surface water must be allowed to completely dissipate before applying. When applying to exposed aggregate as a curing compound, the surface should be washed with a mild acid solution to remove the thin film of cement dust, then flushed with water and allowed to dry before applying BRIGHT KURE & SEAL. 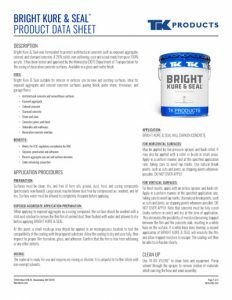 BRIGHT KURE & SEAL WILL DARKEN CONCRETE. May be applied by low-pressure sprayer and back rolled. It may also be applied with a roller or brush in small areas. Apply in a uniform manner and at the specified application rate, taking care to avoid lap marks. Use natural breakpoints, such as cuts and joints, as stopping points whenever possible. DO NOT OVER APPLY. For best results, apply with an airless sprayer and back roll. Apply in a uniform manner at the specified application rate, taking care to avoid lap marks. Use natural breakpoints, such as cuts and joints, as stopping points whenever possible. DO NOT OVER APPLY. Note that concrete must be fully cured (looks uniform in color) and dry at the time of application. This eliminates the possibility of moisture becoming trapped between the film and the concrete slab, resulting in a white haze on the surface. If a white haze does develop, the second application of BRIGHT KURE & SEAL will emulsify the film and allow trapped moisture to escape. The coating will then be able to re-harden clearly. A blend of 100% methyl/methacrylate acrylic polymers in a fast drying aromatic solvent. 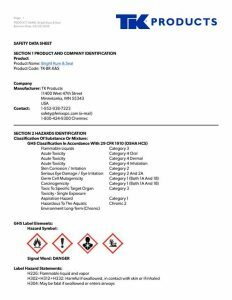 – ASTM C-309, Type 1, Class A & B and Type 1D with a red dye added.